Dyschezia is also known as infant straining. It can be described as inability to defecate clear bowel or difficulty in passing bowel movement. Infant feels great discomfort unless a soft and loose stool is passed. 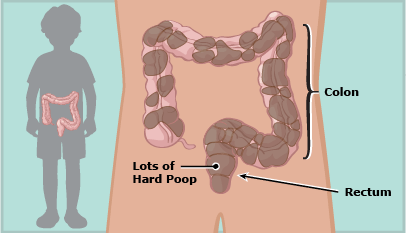 Usually this problem occurs due to lack of synchronization between muscles that are involved in bowel expulsion. Dyschezia or costiveness is the main problem of the disease in which it is difficult to pass bowel movements. The movement can be painful, or, in severe cases, bowel movements may be impossible at all. There are many different causes of dyschezia, including hormonal, anatomical or nutritional factors. This condition can be occurred as a side effect of medications or heavy metal poisoning. Dyschezia can be defined as a functional disorder of bowel due to lack of co-ordination between muscles that are involved in intestinal motility and bowel clearance. This phenomenon might be due to nutritional factors, psychogenic factors, medication side effects or idiopathic in nature. Dyschezia symptoms are common and can be easily identified. For example, the infrequent bowel movements, i.e., less than 4 times a week, it is one of the major symptoms of this disorder. Others include straining at the time of defecation, part of the stool is hard, the sensation of incomplete evacuation and anorectal sensation of blockage. Patient may also feel pain intestinal smooth muscles like a colic pain or feeling of abdominal fullness after each meal. Infants having such problem may also have delayed gastric emptying time. Differential diagnosis indicates that the main causes of dyschezia are due to the hardening of stool, that might be diet or drug related. Impaired peristaltic movements may also lead to dyschezia. A diverticulum is a common medical condition that causes dyschezia.This occurs when tumors develop in the bowel or surrounding tissues of colon area. Other conditions such as hypothyroidism, hypokalemia, lactose intolerance and lead poisoning are some other reasons for dyschezia. Around 30 percent of the population is facing such disruption in the routine of their daily lives. Defecation is one of the most important processes in our digestive system. Many toxins and undigested food or meals expelled from our body through the process of defecation. Changes in bowel movements affect the process of defecation and as a result of this disruption is dyschezia may occur. Some of the most common medical treatment includes enemas, laxatives, and change in diet habits. Many other natural home remedies that are available to treat the disorder. It can usually be cured by increasing the intake of fibrous diet, increase in fluids and improving the lifestyle. If symptoms linger on for more than two months then medical consultation for a more detailed diagnosis of the cause is recommended. Some home remedies that have magical role in the treatment of dyschezia are listed below. Eat two apples daily in the morning time with an empty stomach because apples contain high grade fiber important for bowel evacuation. Drink a glass of warm water by adding lemon juice in it. Also, add some salts to make pleasant taste. Drink this concoction on an empty stomach to improve your bowel movement. It is believed that grapes are a natural laxative, grapes dried in particular is very effective in preventing chronic dyschezia. Soak 10 to 20 grapes dried in the air and have them in the morning with an empty stomach. Prepare fine powder of the following ingredients. Took almost 3 to 4 pieces each; sunflower seeds, almonds, sesame seeds and linseed or flax. Grind them together and take a spoonful of powder with a glass of fruit juice. Avoid grapefruit juice. If constipation is caused due to intake of low grade fiber, take the psyllium husk commonly known as Ispaghol. Add a tablespoon of psyllium shell in a glass of water and soak overnight. Drink this mixture in the morning on an empty stomach.